St. James’ award-worthy production Seussical, the Musical dazzled audiences as the 5th through 8th grade acting troupe led the audience through an imaginative and fantastical mash-up featuring beloved Dr. Seuss characters: the Cat-in-the-Hat, Horton the Elephant, even the Grinch! 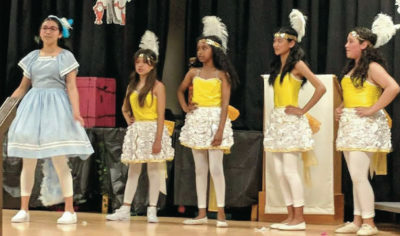 Under the talented guidance of music director, Mr. Jean-Paul Jones, with the support of teachers, Ms. Vantrease and Ms. Caputo, the dedicated cast embraced their roles with the enthusiasm and panache required to bring the whimsical, colorful world of Seussical to life. The incredibly supportive St. James community of parents and teachers collaborated to source and create costumes, props and set designs. Stage crew was staffed by 8th graders who learned behind-the-scenes technical crafts of make-up, lights, sound and more. Saint James is a Catholic elementary school located in the Mission District of San Francisco and an Alliance of Mission District Catholic Schools member. The Dominican Sisters of Mission San Jose in association with their lay partners administer St. James School. Our parochial school serves children of families of varied cultural, ethnic, and socioeconomic backgrounds with all services afforded by the Archdiocese of San Francisco.Empowered by Jesus and His teachings, we accept the responsibility to help develop the gifts and talents of students, parents, and staff alike. We acknowledge that parents are the primary educators of our students, and we strive to work collaboratively to ensure success of all students.